The US-China trade war can only have negative effects in the long run, even if the short term impact have been minimal for trade finance providers in Asia. Those are the views of Standard Chartered’s global head of trade finance, who has called for common sense, as trade tensions continue to escalate. In an interview with GTR in Hong Kong, Farooq Siddiqi voiced concerns over the negative effect the US-China conflict may have on trade and investment sentiment. Citing examples of trade wars in the 1930s and 1970s, Siddiqi says: “When you look at the benefits, did it protect employment or help GDP? The answer is all negative. In the long run, if you have this mutually-assured destruction, it doesn’t help anybody. The question is: at what time does sanity prevail?” Standard Chartered is one of the leading funders of trade in emerging markets and is extremely active throughout emerging Asia, including in China. A sizeable portion of the bank’s book comes from financing trade between China and the rest of Asia. In an earnings call after the bank reported a healthy profit over the first half of 2018, chairman Jose Vinals said: “Our direct exposure to the risks of US-China trade tensions is limited. We generate far more income financing commerce between China and other markets in our footprint — meaning we stand to benefit over time if that were to increase — than we do on trade between China and the US.” This sentiment was echoed by Siddiqi, who says that the US-China trade Standard Chartered finances is “not a material number”. However, it may lead to shifts in production bases, according to research the bank has done with clients in China. “We did research with some companies in the Pearl River Delta, asking them for their your response to the trade war. Some will try to figure out a separate sourcing strategy. In the medium term, they’ll look to move their manufacturing location to another country. The big theme is companies moving south to Asean, Cambodia, Myanmar, and so on,” he says. This research surveyed more than 200 companies working in the Pearl River Delta. Of these, 70% expect a high or medium negative impact from a trade war. This in part explains the shift towards other markets in Asia, a medium-term endeavour that may take three to five years to complete. However, these shifts are likely to occur regardless of the resolution of the trade war, due to the increase in labour costs in China. “Net-net I don’t expect anybody to benefit from the trade war. In the long term it will have a negative impact. In the short term I expect companies to look for tactical places to switch sourcing. In the medium term if it really stays, they will look at rebasing manufacturing into other locations,” Siddiqi says. His views are largely shared among Asia Pacific trade financiers: the industry is yet to experience a material impact from the trade war – with the caveat that the tariffs have only recently started taking effect. “When we think about the trade wars, from my perspective I am more concerned with the trade rhetoric damaging investor sentiment, investor confidence and sending markets lower,” said HSBC’s chief executive John Flint on an earnings call earlier this month. Siddiqi, meanwhile predicts that the future growth engine of global trade will be intra-Asian trade and domestic consumption in emerging markets in the region, namely China, India and Indonesia. This reshuffling of the traditional export model may help shelter the region from future scuffles between the US and China. It may also help banks such as Standard Chartered, which have domestic footprints in these markets. “Traditional factors which drove trade growth in the past were trade between Asia and OECD countries. The EU and US would consume, Asia would produce and sell to those markets. That model is fundamentally changing. Mostly, people will produce to consume it locally: look at markets like Indonesia. Yes, today is dominated by the trade war rhetoric, but these are green shoots that banks like ours are focusing on, because that’s where the revenue growth will be,” he says. 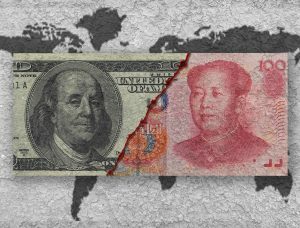 The post Standard Chartered on trade war: “At what time does sanity prevail?” appeared first on Global Trade Review (GTR).